Belvedere Vodka, from the portfolio of Möet Hennessy Louis Vuitton (LVMH) has released a new luminous bottle, featuring precise laser cutting and soft-touch technology, for the on-trade. The new bottle, named Midnight Saber, is to be launched in March 2017 and only available in 1.75L. 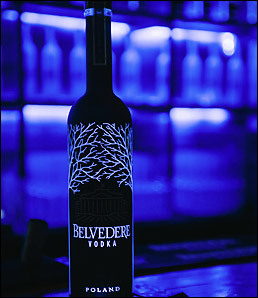 Belvedere claims to have been the first to bring a luminous nightclub bottle to the market in 2012. With exquisite laser etching and delicate black coating, the Midnight Saber design marks the first of its kind in industry packaging. LED lights line the bottom and when turned on produce an effect of misty trees emerging from the bottle.